What was once a barren stretch of desert land has now become a thriving city located within 10 miles of the largest city in Arizona – Phoenix. This makes Glendale perfect for families who don’t want to raise their children in a city-lifestyle but want to have access to all of the amenities of a city. In fact, Glendale has tons of amenities and attractions to enjoy – just on a smaller scale than that of a major metropolitan area such as Phoenix. Due to its close proximity to Phoenix, Glendale is an excellent option for anyone who has to commute to the big city but doesn’t want to live there as well, which is yet another perk for families looking for a suitable town to raise their children in. Known as the “Antique Capital of Arizona,” this moniker could easily lead you to believe that Glendale can’t have much more in the way of amenities. However, you would be mistaken. Although the population in Glendale is rather modest for a city – especially when comparing it to Phoenix, which has a population that’s almost six times Glendale’s size, there are numerous amenities to enjoy. 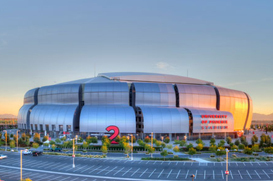 Sports – Glendale is home to both the Jobing.com Arena and the University of Phoenix Stadium. The University of Phoenix Stadium is home to the NFL’s Arizona Cardinals and acted as host to Super Bowl XLII in 2008 and will do so again in 2015 for Super Bowl XLIX. It also hosts the Tostitos Fiesta Bowl college football bowl game every year. The Jobing.com Arena is home to the NHL’s Arizona Coyotes hockey team. Culture – Glendale is very much dedicated to arts and culture, which is apparent from the many museums and theaters around town. If you enjoy live theater performances, then you’re in luck, as the city is home to the Arizona Broadway Theatre, the Brelby Threatre Company and the Theater Works. There are plenty of museums and galleries to check out as well, including the impressive Deer Valley Rock Art Center. There are many different options when it comes to buying real estate in the Glendale area, whether you are looking for a more traditional single-family homes, condos, townhomes or a higher-end luxury homes. Styles of houses you’ll find include ranch-style, split-level style and Sante Fe-style homes. Vistancia – Vistancia is a community that consists of three main neighborhoods: The Village, Blackstone and Trilogy. The Village is a family-friendly neighborhood full of activities and amenities, Blackstone is a luxurious gated golf community and Trilogy is a resort community catering to active adults. Arrowhead – Arrowhead is one of the most sought after neighborhoods in the Glendale area, and for good reason: The neighborhood boasts a family-friendly community, scenic views of lakes and mountains, a mall, plenty of dining and shopping options and both high-end and affordable housing. Fletcher Heights – Fletcher Heights is another family-oriented community known for its peace, safety and comfort. Considering how beautiful the scenic views of Glendale and the surrounding areas are, it would be disappointing if there weren’t a few amenities aimed at all of those outdoor enthusiasts out there. Fortunately, if you’re looking to enjoy the outdoors, you’ll have plenty of options. Thunderbird Park contains 1,000 acres of desert preserve with trails for jogging, biking horseback riding, hiking and more. Then there’s the White Tank Mountain Regional Park right outside of Glendale, which contains a Waterfall Trail along with 21 miles of hiking and biking trails. You also won’t want to miss out on the Glendale Xeriscape Botanical Garden, which has more than 1,000 varieties of desert plants and is free of charge. Arrowhead Elementary School | PK-6 | 7490 W Union Hills Dr.
Hillcrest MIddle School | PK-5 | 22833 N. 71st Ave.
There’s a reason why Glendale was named as the antique capital of the state – there are a ton of places to go shopping around the city! For the best antique shops in town, you’ll want to head to Historic Downtown Glendale, which was named as one of the top ten places for shopping in the entire country by USA Today & Sunset Magazine. In addition to the plentiful antique stores where you can hunt for old treasures, there are a number of shopping centers that are definitely worth checking out, such as the Westgate Entertainment District and the Arrowhead Towne Center. While Glendale has its share of job opportunities, the fact that residents are close to the biggest city in the state means that employment opportunity is much greater than what Glendale offers by itself. The biggest industry in Glendale by far is construction, with public administration and administrative and support services also having a strong presence. Glendale is an excellent city to live in if you are raising a family due to the numerous family-friendly communities and strong school system. The fact that the area has so many amenities and is only within 10 miles of Phoenix are huge draws as well.